Laughter yoga is a practice in which you are taken through a step-by-step process to build a deep sense of joy and whimsy. The main technique is laughing, of course! There's no experience required to attend a class, and there are no restrictions. All you need is an open mind and a willingness to participate in the exercises. The idea behind laughter yoga is similar to the positive psychology philosophy "fake it till you make it." The format is based on research that suggests seeing the smiling faces of others and hearing others laughing compels people to smile and laugh themselves. There is also evidence to support the theory smiling for only a few seconds can bring on feelings of positivity. Hence, the goal of each laughter session is to create a sense of happiness by performing body motions and vocal tones that mimic laughter. How Is Laughter Yoga Different? Laughter yoga is different from a traditional yoga class in that it doesn't include asana practice. You likely won't move enough to build a sweat or even feel your muscles working. There are four steps or basic practices. Most, if not all, of these elements are included in each section of the class. The style will vary depending on the experience and background of the instructor. There are four phases to a laughter yoga session. The first part of class is dedicated to warming up your body with simple movements, such as side steps and arm raises along with your voice with laughter. Just like your typical yoga poses are paired with the movement of your breath, sounds in laughter yoga are often paired with movement as well. Clapping is also utilized to increase energy. The warm up is also a great time for instructors to explain the format and techniques to new students and suggest potential modifications. Exercises or games make up the main portion of a laughter yoga class. They allow you to get into the mode of your imagination to bring out your playful nature. The possibilities are endless, but here are a few that instructors have come up with. If you're interested in trying a few exercises out on your own, you'll find a comprehensive activities guide on Peter Davison's website. He is well-known for his work as a motivational speaker, as well as his music compositions and meditations. At the end of class, students are taken through a laughter meditation to help them release any remnants of laughter that are still left in their systems. Some classes even included guided relaxations. According the Laughter Yoga Life website, this helps to facilitate grounding and allows students to integrate the positive feelings they've built throughout the session into their bodies. The purpose of laughter yoga is to release any unneeded tension and replace it with a sense of joy. It's cultivated through simple games and exercises that allow you to use your imagination like a kid on the playground and have fun while laughing. 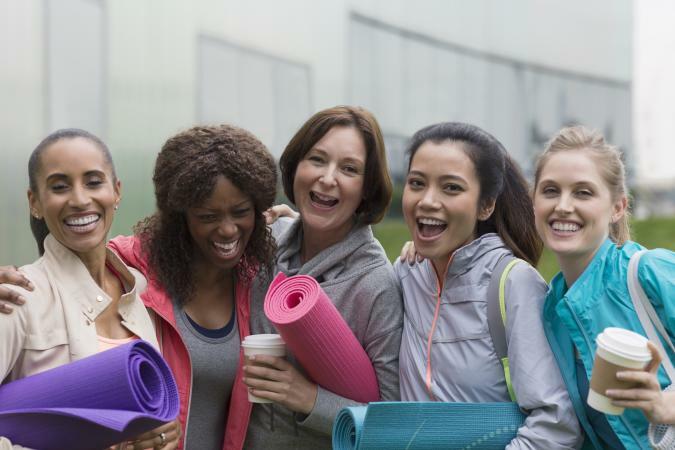 Laughter yoga may not be for everyone, especially those who tend toward cynicism. However, if you are looking to decrease the amount of stress in your life and increase your sense of happiness and delight, you will benefit from at least trying it. You may find it allows you to open up in a way that you haven't before.